Used to possess an older (seventies) spiral bound Boston area road map. The dashed double lines of the marsh alignment were clearly shown. Right up to the southern fringe of Lynn. Don't believe any structures in either Lynn or Peabody were demolished for the 95 alignment, it was cancelled before that could happen. At that time, many of the maps not only showed the dash-lines along the march alignment but north of there to roughly the Peabody/Danvers border as well (south of the MA 114 interchange (now Exit 47A-B)). Do any scans of these maps exist online? The last official (meaning from the Commonwealth) Massachusetts state road map to show the full proposed alignment of I-95 between Revere & Peabody was their 1971 edition. After doing an extensive/exhaustive search, I was not successful in finding any other scans of maps covering that area & vintage. However, I do know that Rand McNally, American Map, etc. showed the proposed I-95 through Lynn (actually, along the eastern edge of Lynn Woods) through their 1974 edition maps. I have one or two hard-copies of those maps from that vintage. Anyone here know what this VMS is for? Or if if has a special purpose? It's rather old and weird-looking. 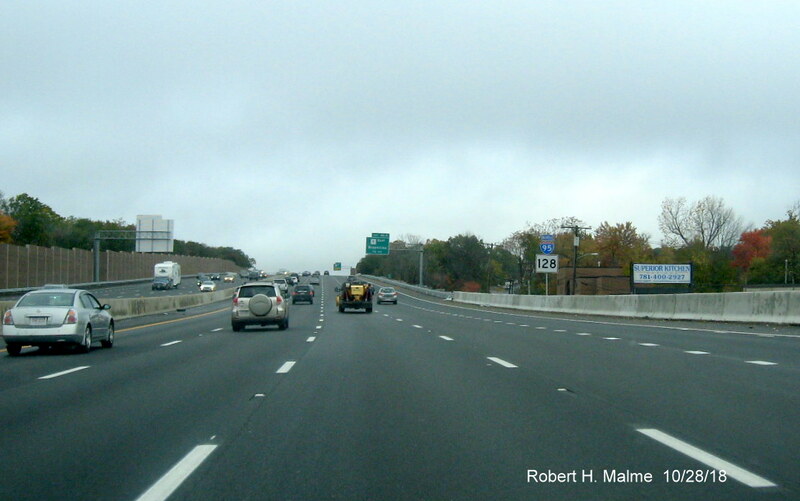 Located on the Mass Pike W-bound near the location of the former Stockbridge toll plaza. 1. Why doesn't MA 213 have any mile markers? 2. Who (or what group) within MassDOT determines route numbers and where state routes go? 3. Why is so little of the state route system under MassDOT jurisdiction? It has two bridge mile markers, one around 0.2 and one around 2, both to 3 decimal places. However, there are no standard mile markers. Some of the state routes are holdovers from the New England Interstate system, while some are coordinated with other states in the case of multi-state routes. Sometimes, a group of them are kind of clustered together (MA 149-151 are all in the same general area, as are 104-106). The rest: who knows? 150 is nowhere near the other two. Adding to the previous comment. Whatever system Mass. developed for its route numbers collapsed early on when the NE Route system gave way to the US Route system in 1927. Under the NE system 1 and 2 digit numbers were reserved for multistate (longer) routes, while 3 digits were in-state (shorter) routes (with a few exceptions). When that system went away, Mass. started assigning two-digit numbers for its own route system, whatever length they were, in many cases changing from recently assigned 3-digit numbers to 2-digit ones. Looking at route lists from the 1929-1933 maps, for example, MA 102 from Taunton to Weymouth was changed to MA 18 in 1931 (which had been assigned 2 years earlier to a shorter route from Rockland to Hingham). Route 102 then reappeared at the other end of the state in W. Stockbridge. While as previously stated, some effort was made to cluster similar numbered routes in one place (MA 130, 132, and 134 on Cape Cod, MA 104, 105 and 106 in the Taunton area), numbers assigned around them were in very different places, MA 107 is in Revere, for example, MA 131 is in Brimfield, MA 133 is Lowell. There was apparently no thought to placing significance on odd vs. even numbers and geographic direction, thus MA 18 is north-south, but so is MA 27, etc. IMO the route number system still largely reflects traffic patterns of the 1950s and thus should be modernized, removing outdated or redundant routes. MA 28, for example, still runs from the Cape to the NH border, though no one would use that route between those 2 destinations today. I would restrict that route to Boston northward, use MA 25 for the Cape Cod portion, and remove the concurrencies it has with many routes south of Boston (MA 18, US 6). This is an interesting post. I can think of some other route numberings in southern New England that don't make sense. If I were heading from Norwich, Conn. to the Boston area, CT/RI/MA 138 would not be my route of choice; except for , perhaps the stretch that goes to I-95 north in RI. Even before the interstate was built, I would've turned left inn Wyoming on to RI-3. RI 102 strikes me as a lazy loop around the Providence area. It's a beautiful drive for the weekends, but I wouldn't use it for commuting purposes or longer distance travel. Fictional discussion has been moved to Fictional Highways. There's an ongoing study looking at where to place a new interchange on the Mass Pike (I-90) between Exit 2 and Exit 3. Now that the Pike has gone full AET, building such an interchange becomes somewhat more practical as there's no need for a trumpet and toll plaza. As much as I like the peacefulness of driving a 30-mile stretch with no exits, it is an absolute PITA if I'm stopping somewhere in the middle. US 20 isn't exactly fast and, on the east end, there's no way around the mess in downtown Westfield. Somewhere within a couple miles of the service area is most likely, as inconvenient as it would be to get from there up to US 20. I wonder if such a thing would include upgrades to Chester/Blandford Road? That was a fabricator error (both for the use of Clearview and the full spelling of the town names) and should have been replaced by now. As of October 2017, those Clearview signs are still there. Thank you. Time for me to make a phone call. What’s going on with the deck of the Alford Street bridge (Mass. 99) between Charlestown and… technically Charlestown, but Everett for all intents and purposes. The bridge underwent a major rehabilitation just a handful of years ago, but now the southbound side is completely closed with crews working on the deck. "The work under this project consists of rehabilitation of the structural, mechanical & electrical systems for the moveable span, replacement of the power and communication cables, new bridge signal equipment, pavement markings and signage, approach span structural repairs, approach roadway reconstruction and all incidental work." Wow, that’s nuts! Something has to have gone wrong for that to be necessary so soon after so large a project. I’m curious who is on the hook for that something wrong. Traffic? No problem, enjoy the scenery! Long live the lovely Sagamore and Bourne bridges and their welcoming traffic bottlenecks for the tourists!